Have you had your fifteen minutes of fame yet? Well, now’s your chance! The chamber is creating the Discover White Mountain Arizona Cookbook and we’re inviting all you cooks, chefs, and wannabe kitchen masters to contribute your favorite recipe—or two (or three!). Each recipe will have its own page and you will receive credit, a cameo photo, and a photo of the finished dish. If you submit your recipe under your company name, we will use your logo, rather than the cameo. This book will be available on Amazon (let’s make it a bestseller! ), at the chamber, on the chamber’s website, on the chamber’s Facebook page, and at chamber events. In addition, local organizations can buy the book at a discount to use for their own fundraising activities. The book will only be 200 pages—and 70 of the pages are already full—so get your recipes in early to guarantee your spot! In addition to recipes, the book will include the White Mountain Vacation & Relocation Guide—the perfect handbook for all our visitors—and chock full of beautiful photography by local artists. At the chamber, we are always looking for ways to tell the world about Pinetop-Lakeside, the heart of the White Mountain. By publishing a book distributed through Amazon, we are able to reach a much wider audience. As a vacation destination, our businesses desperately need the annual influx of visitors. Please help us help our local economy by contributing to and sharing this great publication. If you would like to raise money for your nonprofit or other worthy cause, contact Mechelle at the chamber, mechelle@pinetoplakesidechamber.com or complete the form below if you are interested in purchasing the cookbooks in bulk at a special, discounted price. You must sell the books at full retail, but you keep all the profits. Depending upon the final page count, we expect to set the retail price at $25 to $35. Your organization will keep $10 per book. It’s a win-win! Your organization raises funds, the chamber raises funds, and we all raise awareness about our special area! If you are interested in selling the White Mountain Arizona Cookbook to raise money for your organization or cause, please complete this form and we will respond promptly. 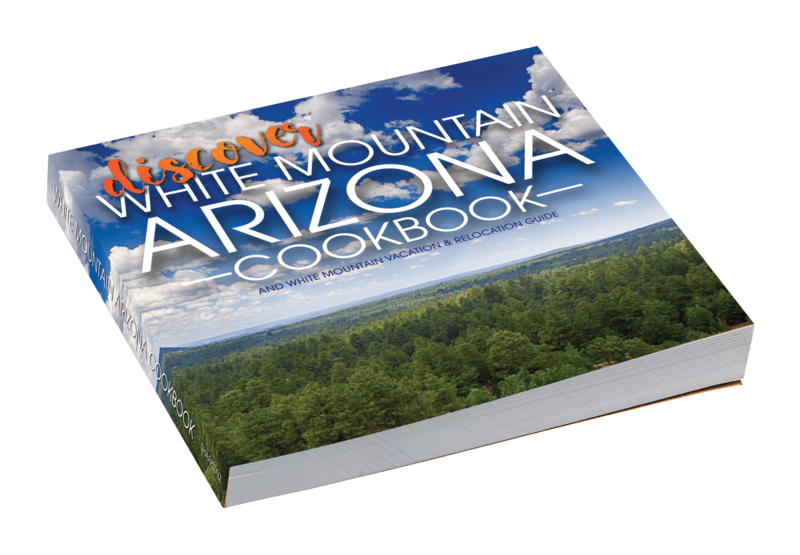 If you are a White Mountain resident (part or full time) and would like to have your recipe(s) included in the Discover White Mountain Arizona Cookbook, please complete this form or mail your recipe to: Pinetop-Lakeside Chamber of Commerce, 518 W White Mountain Blvd., Lakeside, AZ 85929. You will automatically be subscribed to receive emails about the chamber's events, including the book's publication date. If you have a scan or digital file of your recipe, you may upload it here instead of typing it. Do you have a story to go along with your recipe? With my signature below, I attest I am the creator of this recipe, have full rights, and grant the Pinetop-Lakeside Chamber of Commerce permission reproduce my recipe in the White Mountain AZ Cookbook properly credited to me, but without compensation of any sort.